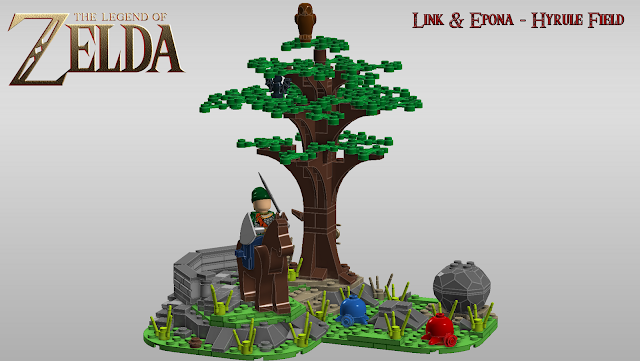 WHICH YOU MAY SUPPORT SHOULD YOU AS ME DESIRE AN OFFICIAL LEGO ZELDA PRODUCT! The link above will take you to the project where you may support it! 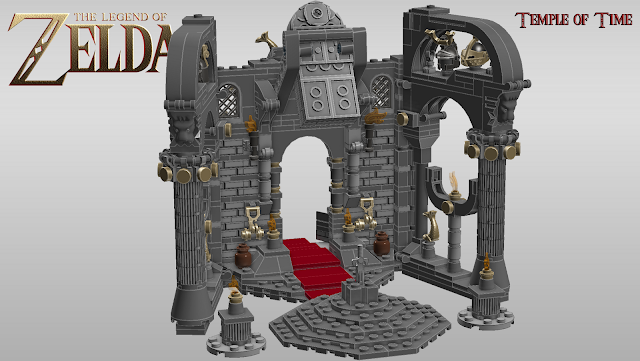 Over at CUUSOO image quantity is restricted so I'll be posting everything related to LEGO here. I still do need more practice to achieve a more painterly feel. 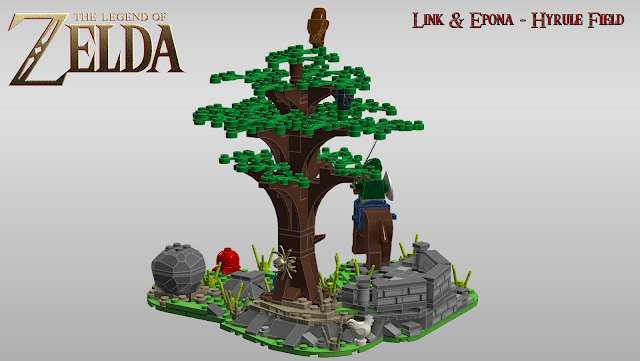 At any rate this is one of many visions I see LEGO Zelda best represented. Due to time I dropped several elements, but will be making more art eventually. 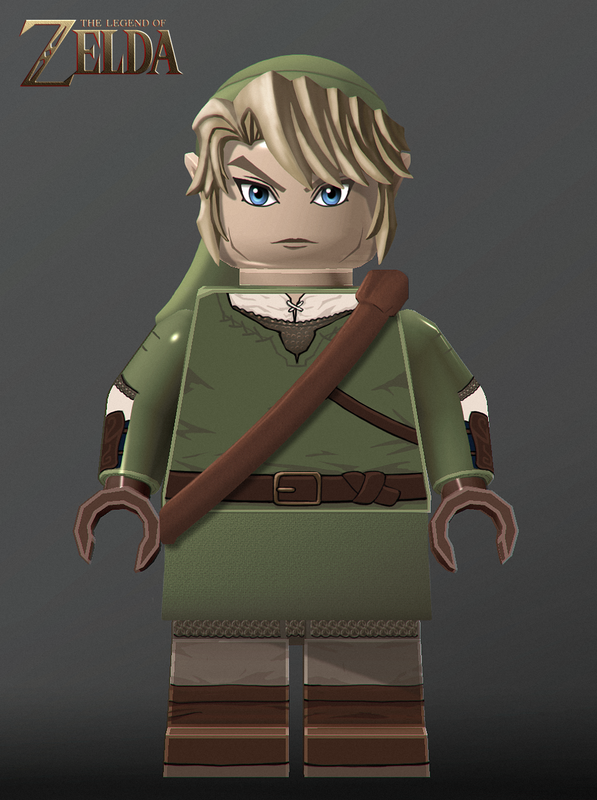 So far only one has been designed in detail, namely the Hero himself: LINK!!! LEGO is all about quality, so are Nintendo with their games, and as a perfectionist myself I would only want the best, most accomplished and accurate figure in the LEGO medium. 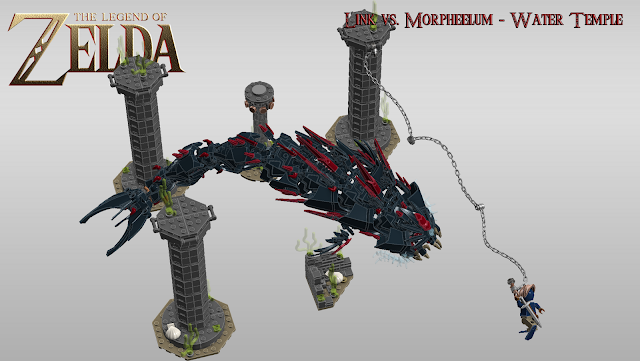 And this is the current result. He is still lacking a Scabbard for the Master Sword and Hylian Shield. Using a fabric tunic/skirt piece similar to that of the Bagpiper minifig in LEGO's 7th wave of Collectible Minifigures. 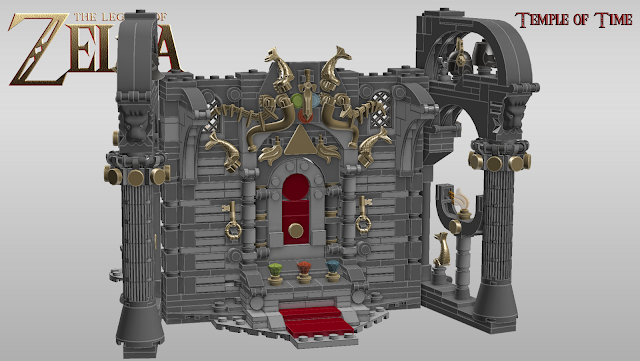 And by details I would even suggest printing some of the ornamental pattern seen in Twilight Princess on it as well, including a split on the sides. Next is one idea of three for a "Triforce set" which would consist of three separate sets, each with a Triforce wielder and their respective Triforce piece. 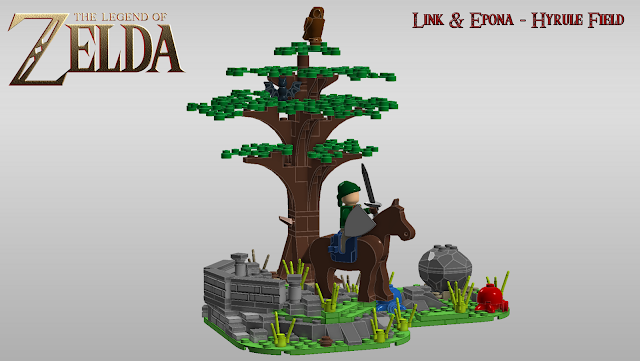 Here's Link and Epona in Hyrule Field with Octoroks, Keese, and old Kaepora Gaebora in the tree. The idea is to have a brick wall reminding of the one stretching trough the field in OoT. With LEGO's new horse figures implemented, Epona would in a prancing posture add much to the Zelda feeling of it. And of course I had to add the iconic murderers of the franchise.. THE CUCCOS! Lurking behind the wall.. waiting.. for the perfect moment. 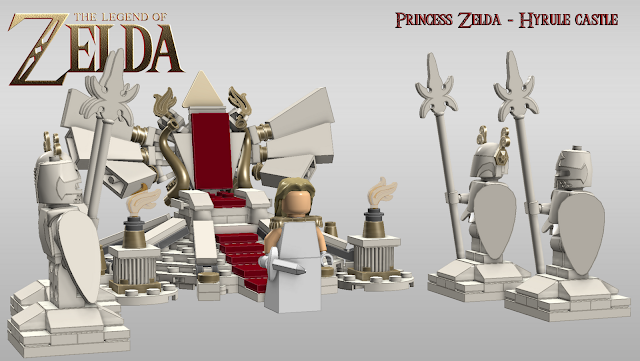 Moving on to the next Triforce Wielder and title character Princess Zelda of Hyrule! 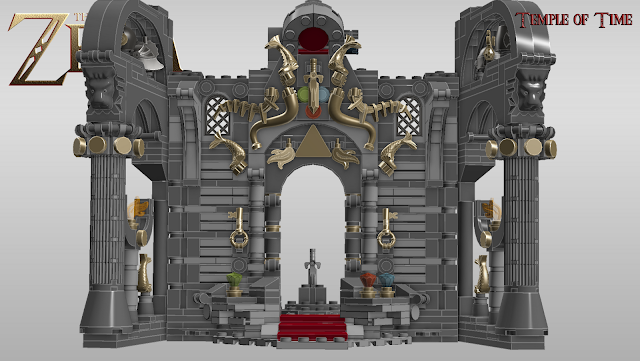 My personal take on a Royal Throne fit for the King of Hyrule.. would actually add Daphnes Nohansen Hyrule himself.. but he has unfortunately just appeared in one game.. guess he's too awesome for more! I wanted to have the Throne remind us of the Royal Crest, which has proven itself a tricky task, as you would have 4 feathers stretching out per wing with limited space.. so while trying to keep it sturdy yet detailed enough I had to cut out the last one in order to hold the aesthetics consistent. 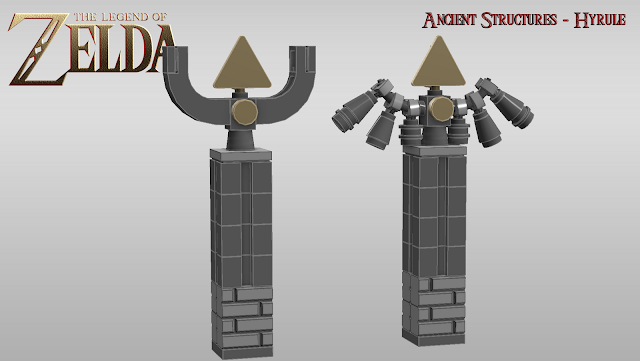 If not it would turn out more like these pillars.. 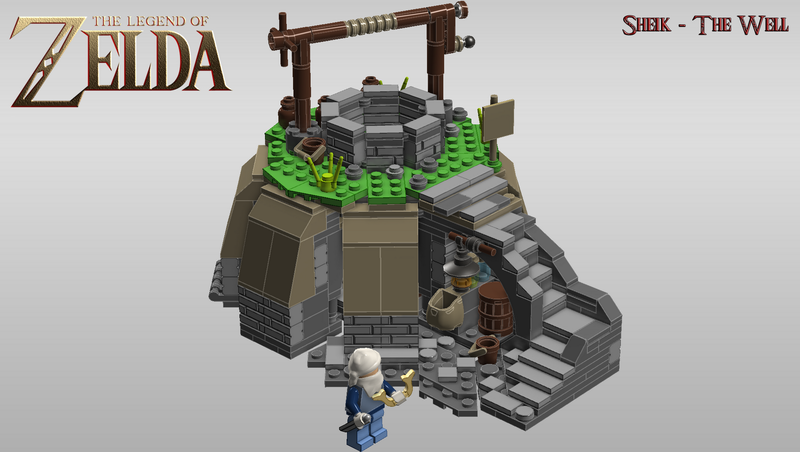 Which won't prove LEGO friendly in an official context. 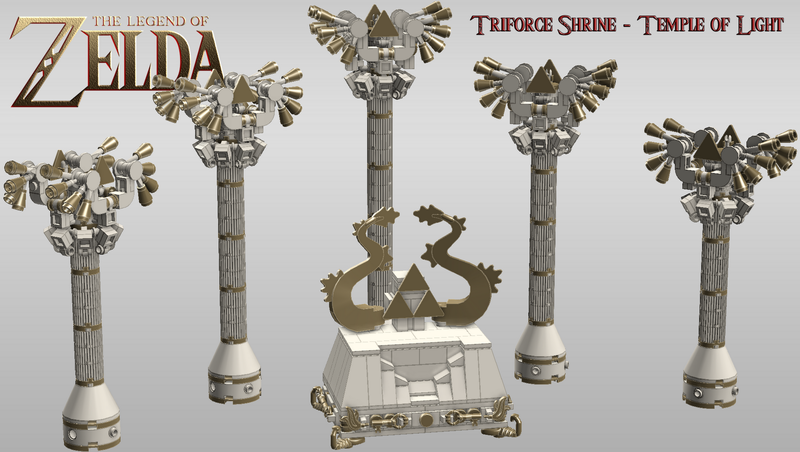 Anyway, here's the Triforce Shrine or Altar, usually located in the Temple of Light, thus all the gloriously detailed crests everywhere! In retrospect, yes I do notice that having double crest ornaments is too much, there shouldn't be more than one per pillar. Then we have the Temple of Time.. or at least my take on it for a smaller scale. 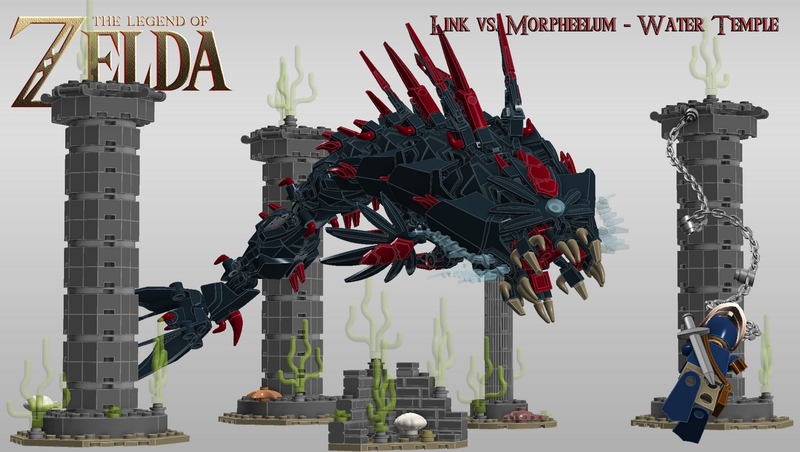 The Door of Time shall open, revealing the Legendary Sword of Evil's Bane.. 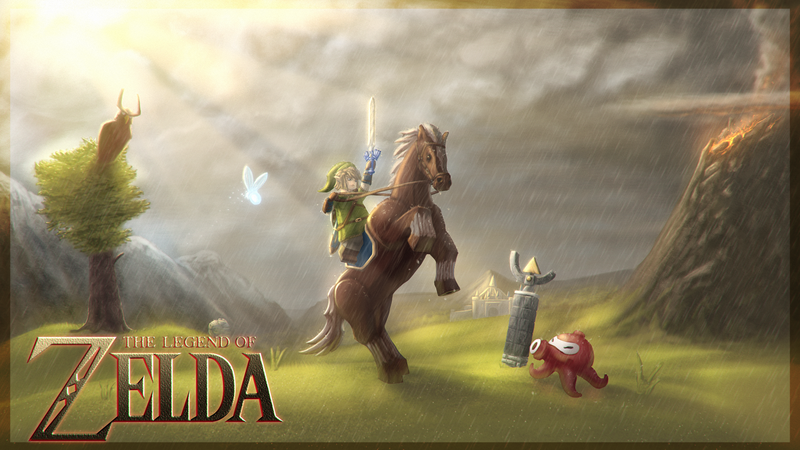 The Master Sword! I originally wanted to fit in some mechanics allowing you to open the Door only by turning a gear... but again, time is not always there. And those brown heads there are supposed to represent jars.. This is construction wise one of my favorites, due to the solid structure and simple play value it would contain. 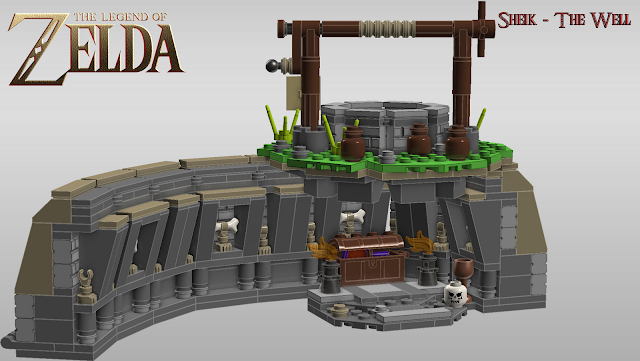 The well itself being Sheikah ruins, needed that dark gloomy feeling, yet some impressions of a solid architecture. And so became the result, fold it out to reveal... no Dead Hand, Redeads or Floormasters?.. I did think about putting a skeleton into there, but I figure the skull already states an example for now. 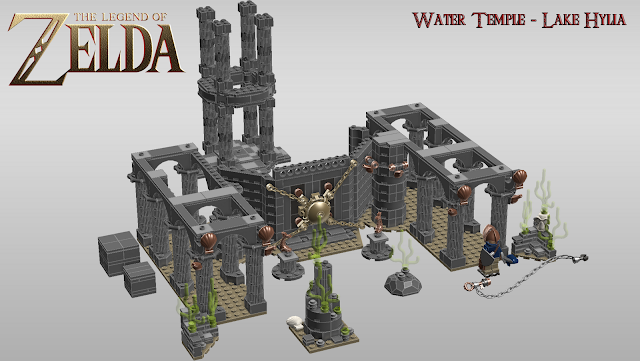 A Water Temple, I personally love submerged temples, and I don't get all the fuzz about the confusing horrors of the Water Temples either... although Zora architects have their way around things, the idea of an ancient abandoned temple of several floors is exciting.. and I do look forward to complete this one some day. BUT THAT MIGHT BE A GOOD IDEA! Morpheelum, my personal take on Morpheel from Twiligh Princess, I really love that design, which is why I chose to build it in the first place. And I do love ancient pillars! Another thing I found interesting is the effect the round 1x1 tile would do in transparent medium blue colour for this shot.. the eye just gets another dimension of creepy Zeldaesque awesomeness! No matter how much I like this idea, I believe it wouldn't make much of a set.. at least not for an affordable price. 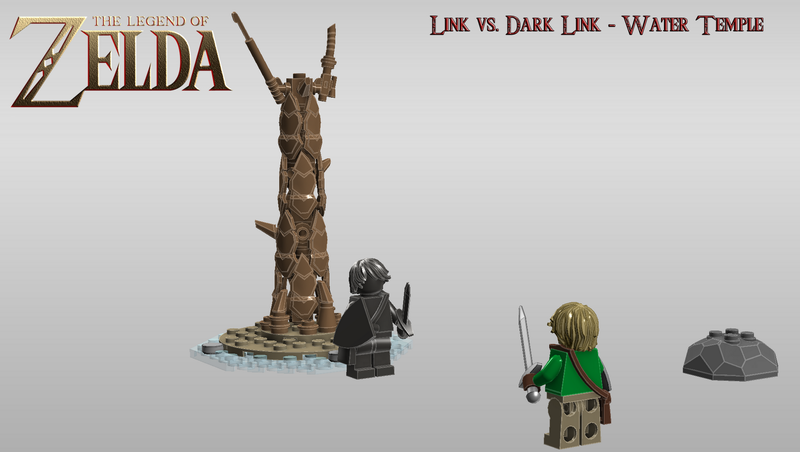 While we are at Water Temples, how can one not include the battle against Dark Link? As iconic as it is, it makes a great foundation for a small set... although that tree is somewhat... well in the game it looked like a smoothly deformed Y, so it's not the easiest thing to convert to the LEGO format. 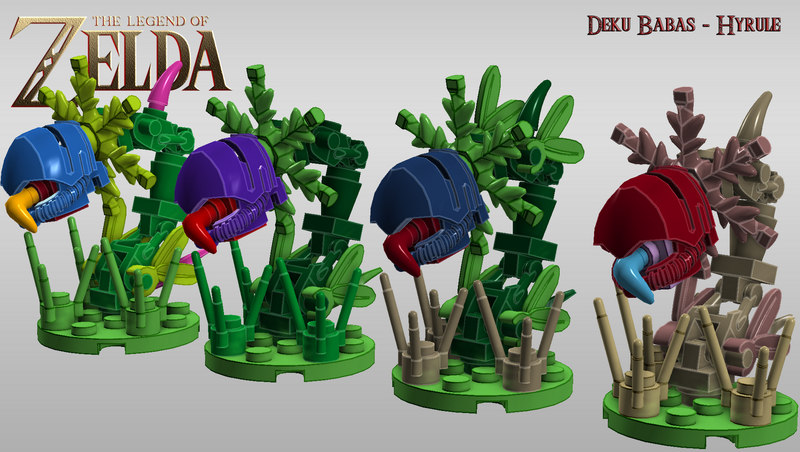 The carnivorous Deku Babas (and Baba Serpent to the right), here represented chronologically, from Skyward Sword, to Ocarina of Time and Twilight Princess. 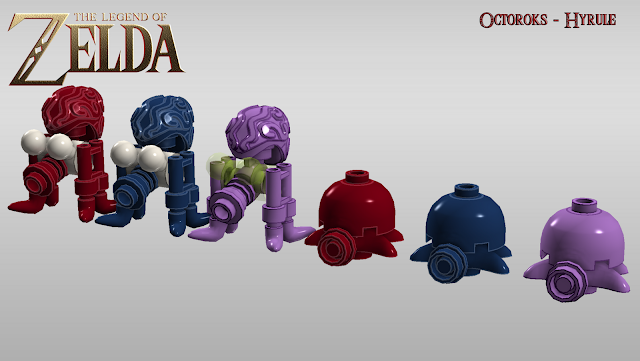 Something lacking from Twilight Princess was the Octoroks! Here I have 2 versions in 3 types of colours, the OoT version and the more classic version revitalized trough the Four Sword games. Also, trust me, they do look many times better when they've got paint/print for the eyes, this is just to document the construction and colour range. 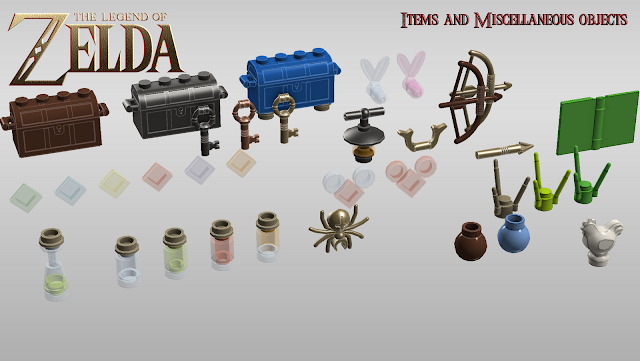 Items and objects, they're what defines Zelda's gameplay. Chests, wooden, metal and boss key chest, followed by keys, in iron, in copper or a rusty one, and the Big/Boss key. Rupees are simply realized by using transparent 1x1 tiles, as it is the closest you will get by normal pieces. Then there's a Magic Vial, Empty Bottle, green and red potion, and lantern oil. Golden Skulltula.. which in itself is a neat addition. Pieces of Heart and/or Heart containers would be needing an unique mould, as building them is proving quite impossible. The Lantern, a simple item yet a very iconic one in my eyes, I imagine the handle could be made using the handle of the existing LEGO keys shortened to fit into a transparent orange "Fez" cone piece, trough a dish over it. Sheik or Zelda's Harp (be it you prefer OoT or SS). Faries, made by simply attaching a double feather/plume piece onto a "Barakki eye" piece! 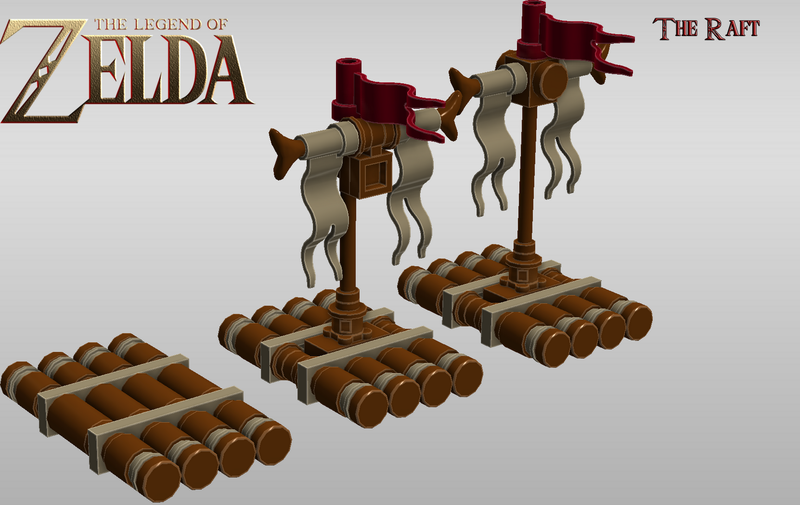 Hero's Bow, and Zeldas Light Bow, accompanied by a Light Arrow. The Book of Mudora, ancient books are always cool, and it's all about the history of Hyrule! Grass, what is Zelda without crass to cut down? Where would you then get new item refill, rupees and hearts?! At least I would love to see Dark Tan coloured grass, along with lime coloured as well. Jars, we need jars to put rupees in! Both in the same brown as included with the Series 6 Minifig Leprechaun, and in a dimmed bright blue as in Wind Waker! And again.. Cuccos.. they're everywhere! And Lastly , The Raft, Links personal vessel for crossing dangerously deep waters. It's a pretty neat asset to links arsenal.. why has it been forgotten?! That being all for now, I hope it was of some interest. I don't know when I will return with more, but I will eventually when time allows!